In our previous posts on Google Classroom, we explained an intro to Google Classroom, how to set up your Classroom page, how to create an assignment, and how to assess student work in Google Classroom. This post will go over the Ask a Question feature Google introduced in August. 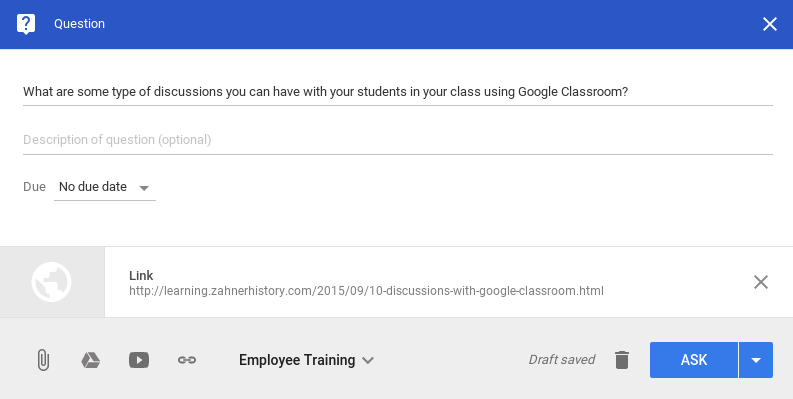 This feature allows teachers to ask, manage, and grade discussions within Classroom. Students only get to provide one answer per question. Creating a question for students to answer is very easy. Just select the “+” at the lower right side of the screen and choose “Create question“. You will enter a title for your question and add a optional description of what you are looking for in students answers. You can also choose to have a due date or not. Not having a due date or providing a date far out in advance would give students a chance to add comments throughout the school year. Like an announcement or an assignment, you can also add materials to your question to help guide students’ answers. After you click the ASK button, you are presented with two options for students. If you want students to only leave their answers for your eyes only, uncheck the option to allow students to see each other’s answers. Also, you can allow students to edit their answers after they click submit from their Classroom page. Both of these options can be changed after submitting your question. They are provided a link to see their classmates answers. If you allow students to reply to other student’s answers, this link will allow them to see their classmates answers. If you allow students to edit their answers, this button will be visible. After you post your question, it will look just like the assignment or announcement types with the title of your question, the link to any materials, and the count of how many students have answered and not answered the question. Just like reviewing student assignments, you will see a similar screen for reviewing student answers. Add a grade, if desired, for the student’s answer. This is the student’s answer to your question. View any replies by other students on this student’s answer. You can also add your own comments to a student’s answer for other students to see. Use the RETURN button to give students their scores. This has been a review of how to use the “Ask a Question” feature in Google Classroom. This option is a great way to getting feedback, reflecting, or using exit-tickets. 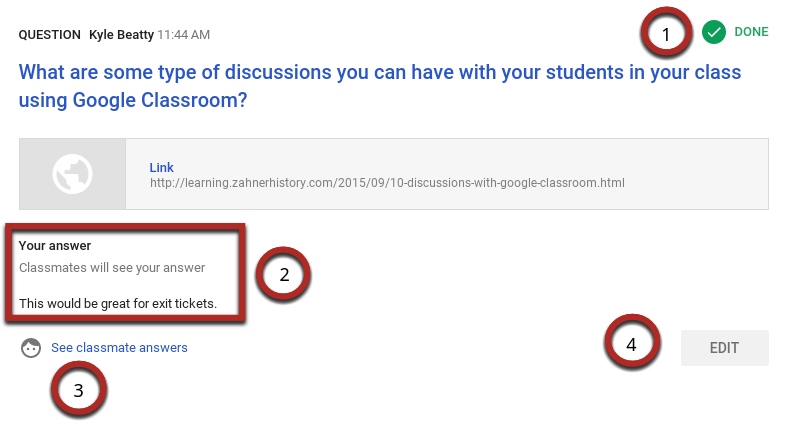 For more ideas of the types of discussions you can use in Google Classroom with your students, check out this post. In the next post we will review how Google Classroom looks from a student’s perspective. In the last post, we went over the process for creating a announcements and assignments. In this post we will go over how to assess student work that has been turned in by your students. Before we get started, Google Classroom allows you to assign work and collect it. What Google Classroom does not have is a gradebook. This allows you to use Google Classroom with whatever gradebook system you have. 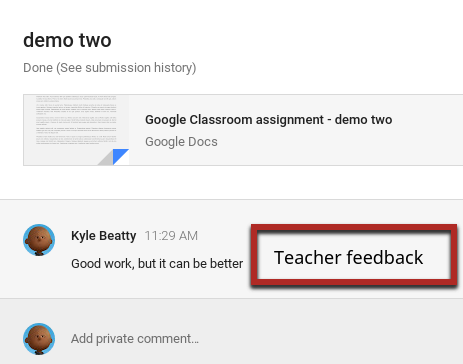 Google Classroom makes it easy to quickly provide students feedback either directly on their document by inserting comments or by leaving a comment in the grading list. For the assignment you are assessing, locate the assignment in the stream. Clicking on the assignment title will show you the list of all students enrolled in the class. Clicking on the numbers allows you to filter your view by who has turned in their assignment or by who has not turned in their work yet. Once a student has turned in their work, you become an editor of their document and their Google Document is locked into View only mode for them. Students will not see any comments you add using the comment system in Google Docs until you return the work to them. If you would like for them to view your comments while you are commenting on their work, you will need to change the sharing permissions on their document to Can Comment. 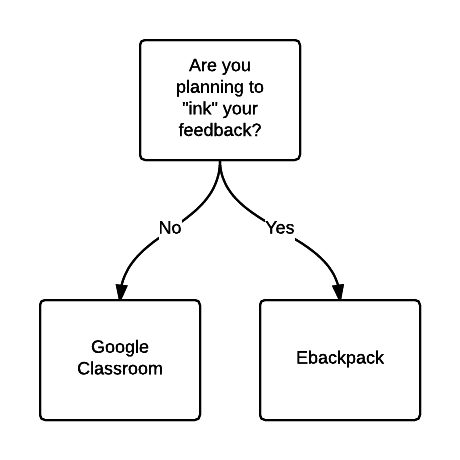 Alternatively, you can provide feedback in Google Classroom. 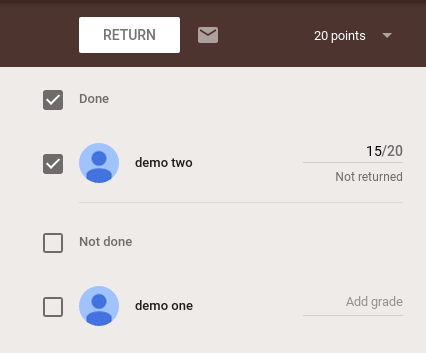 Students will get an email and a notification when you give back feedback from within Google Classroom. Google Classroom defaults to 100 points for an assignment. Above the list of student names is the point value for the assignment. A drop-down menu allows you to change the points possible to 1, 20, 50, 100 or mark as “Ungraded.” Clicking on the point values allows you to type over the default value and insert a custom value. At this time, decimal or letter values are not possible. Enter student points earned by clicking on the slot in each students row. Pressing enter or tab does not go to the next student. Use your mouse to select the next student and type their grade. Student attachments are automatically saved in a folder in Google Drive. 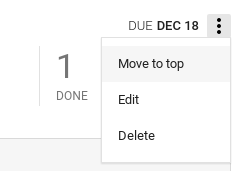 Above the list of student names is a button to link to the folder in Google Classroom that has that assignments student work. Student work is appended with their name to make it easy to identify their work in Google Drive. 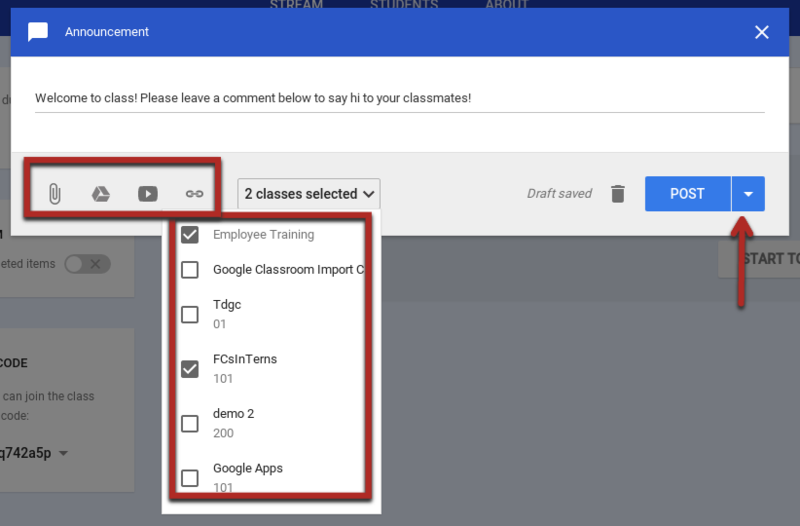 You can click on individual student assignments or use preview mode in Google Drive to view multiple students quickly. When students submit an attachment to an assignment the teacher becomes the owner of the document and the student loses editing rights. Returning work to students allows them to have editing rights. 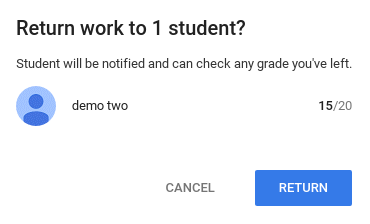 Check the checkbox next to each student you wish to return work to. This is done automatically if you insert a score for a student. Click the blue return button to return the work. If you are allowing students to resubmit work with corrections after you return their work to them, students have a chance to resubmit their work for the same assignment. You can view each students record of their submissions by clicking the submission history link for each student. 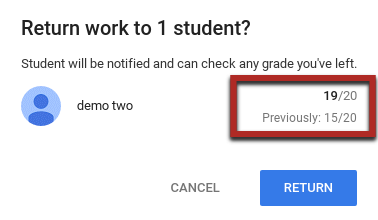 When you return the student work and if you change their grade, the student will be notified when you click the return button. The assignment list shows all of the assignments. In the same way as if the assignments were listed in the stream you can click on the assignment title to view a list of all students or click on the number done to only view a list of students who have submitted the assignment. If you have graded or provided feedback to students you can click on the 3 stacked dots on the right-hand side of each assignment. This will reveal the option to “Mark as reviewed.” Marking as reviewed removes the assignment from the assignment list and moves it to the “Reviewed” tab. 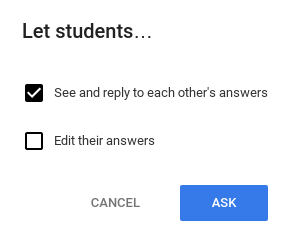 In the next post, we will go over how to create a short question/discussion to students in the class stream at any time, with options to allow students to edit their own answer, and to see and reply to classmates’ answers. Students answer the question in the class stream, and teachers have the option to grade answers. 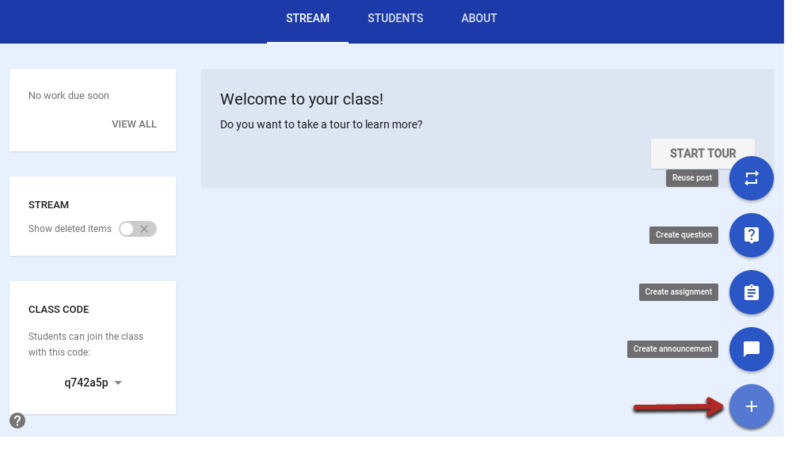 In our previous post on Google Classroom, we explained how to setup your Google Classroom with a custom theme and adding course information and materials to the About section. You just posted your assignment in Veracross and you want to use Google Classroom to collect student work because you do not need to give students inked feedback on their work. Here are some easy steps to creating an assignment or an announcement. This is a good way to communicate with your class and give them up-to-date information. Click the “Announcement” button to display a message to your class. You can even attach files (from Google Drive and otherwise), add YouTube videos and provide links. Tip: If you assign an activity outside of Classroom (i.e. a news article to read), you can link to it in an announcement so there’s a record of it in your class. On the announcement screen, you must enter text before you can post your announcement. Going left to right, you have options to upload an attachment, attach content you have in Google Drive, add a link to a YouTube video, and add a link to any website. 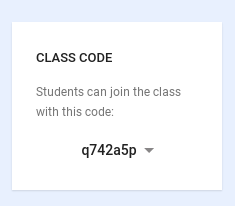 If you are making this announcement across multiple classes, click the dropdown arrow next to the class name to select another course you are a teacher of. Click the POST button to send out your announcement. If you aren’t ready to post your announcement, clicking the small arrow next to POST will allow you to save your announcement as a draft. Students may comment on announcements. Creating an assignment is exactly the same as creating an announcement except for the addition of a due date and the ability to give each student their own copy of a Google Document/Sheet/Slide/Form. Enter a title for your assignment. After you have created your assignment in Veracross, you should copy your descriptive text from Veracross and paste it in the description area of your Classroom assignment. You can set a due date and an optional time. You can also set the assignment to not have a due date. 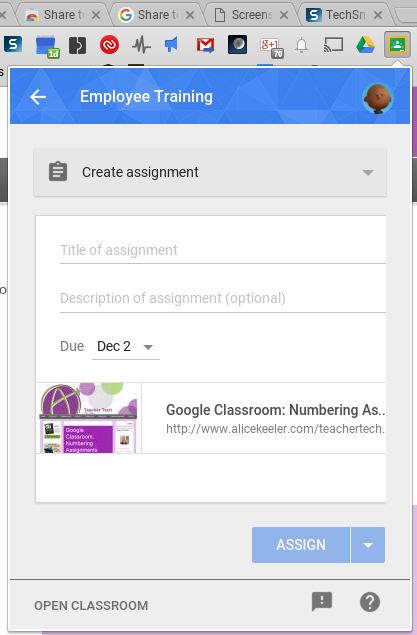 Just like the announcement, you can add attachments, Google Documents, YouTube videos, and links to an assignment. You can add multiple resources to the same assignment. 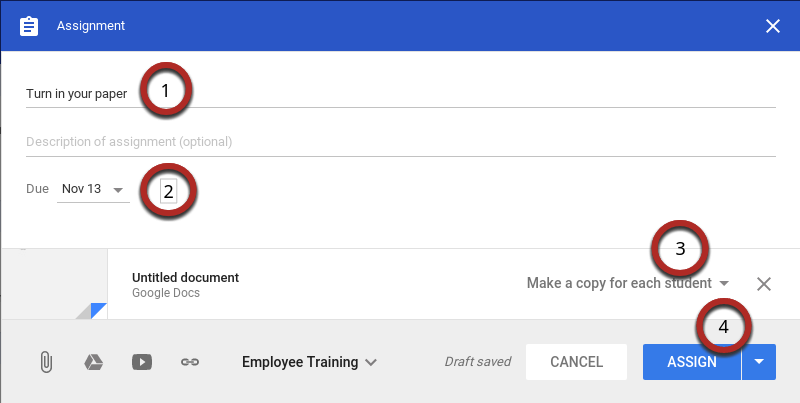 If you are adding a Google Document file, you have the option to allow students to only view, to edit the file(all students have access to the same file), or to give each student their own copy. Click the ASSIGN button to post the assignment. Students will get an email and notification on their iPad from the Classroom app immediately. Using the dropdown arrow, you can save your assignment as a draft if you aren’t ready to post just yet. If you are attaching a Google Form to an assignment (usually an online quiz or survey) the student receives a link in their view of the assignment that takes them straight to the Form. 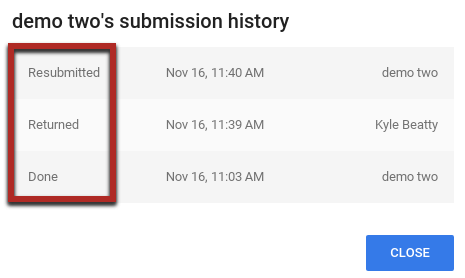 They click submit to finish the Form/quiz and it automatically marks them as done in Google Classroom. This is what your assignment looks like after you post it. The due date of the assignment. This is editable if you need to make a change to the due date. The text turns red if the assignment is due the next day. A listing of how many students have turned in the assignment. Clicking that area takes you to a list of the students in your class and the work they have submitted. 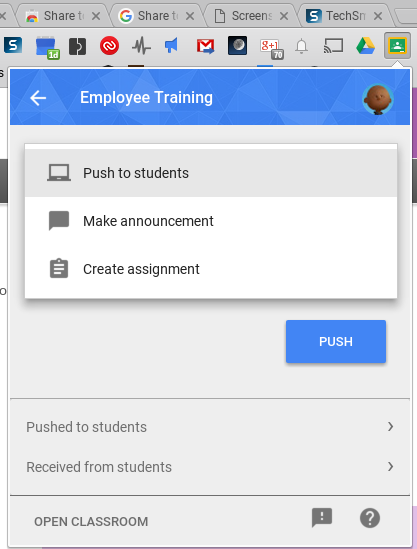 This has been a look at how to create announcements and assignments in Google Classroom. The next post will focus on how to assess work students have turned in using Google Classroom. In the last post on Google Classroom, a very broad overview of the differences between Google Classroom, eBackpack, and Hapara Teacher Dashboard was given. 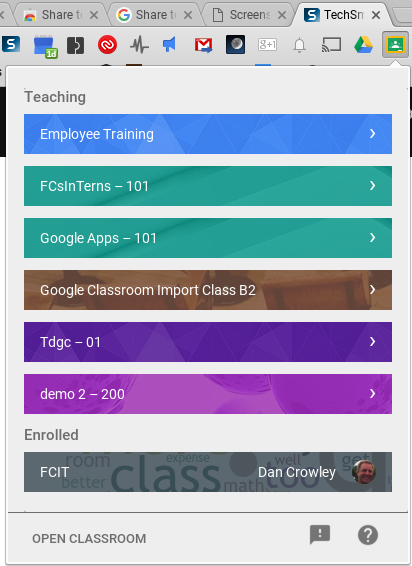 This post will introduce you to the Google Classroom interface. To get to Google Classroom from your browser, go to classroom.google.com. You and your students should download the Classroom app as well. You can only use Google Classroom with your FCS Google account. The first time you log in, if you are a Middle or Upper School you will see a listing of all of the classes you teach. Before you can use Classroom with your students, you will have to click the Activate button on each class listed. If you do not see any classes or if you do see classes but would like to create your own Classroom, click the “+” in the upper right corner to make a new class. Once your class is created or you open the classes that have been created for you, you should take a second and choose a theme if you don’t like the theme that Google chose for you. Google tries to set a picture that reflects the name of your class. It can be hit or miss. At the top right, click “Change class theme” on the right side of the header. It will open a gallery of header images you can use to spice up your classroom. The About page (accessible from the middle menu bar) is home to the course name, description, location, and instructor contact information. In addition, there is a Materials section that allows the instructor to add files from Google Drive. 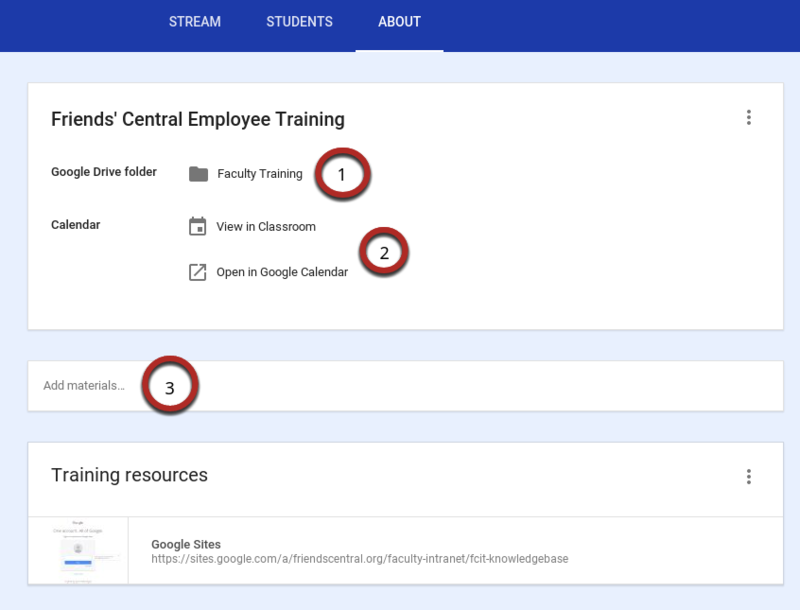 Each Classroom course has a Google Calendar associated with it. All of your assignments will also be listed in a Google Calendar that you and students can see. Add materials. This is a great place to link course specific documents that will be referenced regularly (syllabus, reading list, Google Drive folder with all the documents needed for the course, etc). If you are using the classes that have been created for you already, you can skip this part. If you have created your own class, have them log into Classroom with their FCS Google account and click the “+” just like you did. It will prompt them for a class code, which you can give them (write it on the board, show it on a projector, etc.). Once they enter it, they’re in! You are not limited to just adding students into a Classroom. You can also add other faculty and staff as students or co-teachers. This would be a great use for departments to share and collaborate on documents with each other while maintaining a one-stop-shop for all your communications. This post has described how to customize the look of your Classroom, add information and materials to the About page, and how to add students to your Classroom. In the next post, we will discuss how to create assignments and announcements. Google Classroom. You’ve heard about it but you don’t know where or how it fits into Friends’ Central’s electronic workflow. This is the beginning of a series of posts on how to use Google Classroom effectively with your classes. 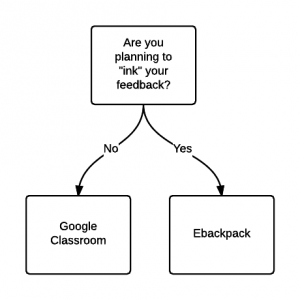 First, what are the differences between Google Classroom, eBackpack, and Hapara Teacher Dashboard? Google Classroom and Hapara provide similar functions. Hapara allows you to push out documents and files to students and then you can see those student documents in a simple dashboard view. But that is all it does. 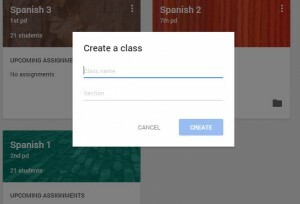 Google Classroom also allows you to push out documents, files, and links to students, but it associates those documents with an assignment making it easier for students and teachers to know what documents are tied to the assignment. Students can keep track of what’s due on the assignments page and on the class Calendar and begin working with just a click. Teachers can quickly see who has or hasn’t completed the work, and provide direct, real-time feedback and grades right in Classroom. Attach a Google Form to an assignment and when that students submits their response it is marked as done in Classroom. Each class has a calendar, and work with a due date is automatically added to the calendar. Teachers and students can view the calendar in Classroom, or in Google Calendar on their computers and mobile devices. Share to Classroom with Chrome: Teachers can use the Share to Classroom Chrome extension to share web content to to their classes. Teachers can use the extension to create an assignment or announcement in Classroom from any web page. 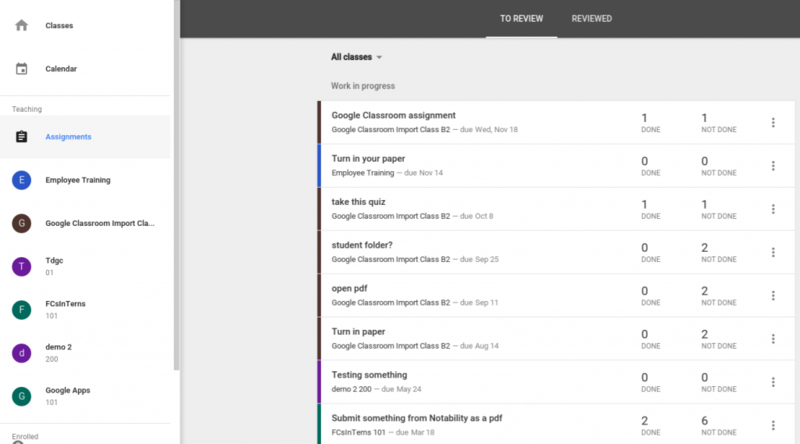 Classroom weaves together Google Docs, Drive, and Gmail so teachers can create and collect assignments paperlessly. Within Classroom, teachers can create an assignment, use it in multiple classes, and choose how students complete the assignment (for example, whether each student receives an individual copy or all students work in the same copy of the assignment). The teacher can track who has completed the assignment and who hasn’t, and provide feedback to individual students. Teacher selects the option to create a copy of the Google Doc for each student and sends the assignment to the class. After turning in an assignment, the student loses edit access to the Doc but remains a viewer. The teacher edits the Doc to grade the assignment, returns it to the student, and editing access is again transferred to the student. Both the teacher and students can see a list of pending and completed class assignments. The teacher can see the all of the grades for an assignment(assignments do not have to be graded), and students can see their own grades for completed assignments. This was a broad introduction to Google Classroom. The next post will will focus on the Classroom interface.